When it comes to market share, Walmart has got it over any other food chain in the U.S. by a wide margin. With 21% of the market cornered, their closest competitor, Kroger, has a measly 8.8%. Walmart tops the list of supermarkets. With its headquarters in Bentonville, Arkansas, Walmart (NYSE: WMT) has become the largest retailer of groceries in the U.S. with 61% of sales coming from the selling of groceries. It is the leader in supermarket sales in the U.S with an estimated $158 billion. Total U.S. sales are estimated to be $258.2 billion. Walmart rebranded its name in 2008, from Wal-Mart to Walmart. It is the largest corporation in the world based on revenue. It is also the largest private employer in the world, with over 2 million employees. As of January 2010 (the most recent data available) Walmart runs 2,747 Supercenters throughout the U.S., with locations in nearly every state. In addition, there are 843 regular Walmart discount stores in nearly every state. Walmart also owns and operates Sam’s Club, which is a warehouse-style store with a mix of merchandise, including bulk groceries. Factoring in Sam’s Club and Walmart’s international stores, they take in an astronomical $405 billion. Their U.S. sales alone equal $258.2 billion. With $158 billion of which is related to foodstuffs. 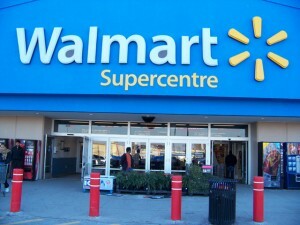 Walmart’s international presence includes a separate division in Canada. Internationally, they operate 8,500 stores in 15 different countries, operating under 55 different names: as Walmart in the U.S. and Puerto Rico, Walmex in Mexico, Asda in the U.K., Seiyu in Japan, and India as Best Price (financial information quoted is for U.S. only). I am writing this note to make you aware of a potential choking/impaling problem with one of you products. On 8/16/2014 I purchased 3 cartons containing 12 each of your Valu Time Fudge Bars from our local Food City store in Colonial Heights, TN. On Sunday 8/17/2014 we had a family reunion at our home where we had a cook-out with various desserts including the Valu Time Fudge Bars. From the first box that we opened my wife tore and pulled the paper down but not exposing the stick for our 6 year old niece Sabrina. Sabrina walked off then quickly returned saying look at this Aunt Linda. Sabrina had pulled the paper the rest of the way off exposing not only 1, but another half of a stick jutting jagged edge out the bottom of the Fudge Bar beside the regular stick at an angle. We were quite surprised and could only have imagined what may have happened as Sabrina likes to rough-house with her older cousins and brother. Needless to say the rest of the Fudge Bars from the 3 cartons were placed in he kids were not crazy about this but they survived! I took pictures of the Fudge Bar with the broken stick jutting out, as well as well as the carton with the date code and other information stamped on the opening side cover.